This revelation comes to us from an interview Microsoft gave. Microsoft’s official website still bills MSE as offering “comprehensive malware protection” without any hint that they no longer recommend using it. Microsoft is not communicating well with its users. Microsoft Security Essentials was once on top of the rankings. In 2009, AV-Comparatives.org gave it a very high score and said it was the best-performing free antivirus. MSE was very appealing to Windows geeks like us, who quickly latched onto it. It received very good malware detection scores, was extremely speedy, and was free. Not only was it available for free — it wouldn’t hassle you and try to upsell you to paid antivirus solutions, like AVG and avast! do. MSE was a breath of fresh air — both in its interface and its speedy performance. Its test results showed it was ahead of the pack, so it was best antivirus at the time. We’ve been recommending MSE as the free antivirus to use for years because of this. It’s included by default on Windows 8 and named “Windows Defender.” This is one of the big security improvements in Windows 8 — you have an antivirus included so every Windows user has protection. It would be nice if Windows users finally didn’t have to seek out a third-party antivirus. Over the past several years, Microsoft Security Essentials has slid in the malware detection scoring tests. AV-TEST’s 2011 annual review ranked Microsoft Security Essentials last place in protection among all the products it tested. In October 2012, Microsoft Security Essentials scored so low that it lost its AV-TEST certification. In June 2013, MSE received a zero protection score from AV-TEST — the lowest possible score. It’s also come last in other recent tests, including one by Dennis Technology Labs.
. When it comes to malware protection, it tested below every other antivirus program tested. At the time, Microsoft argued that the tests were not representative of the real world. They said they were focused on trying to stop real-world threats, not compete in tests where the detection of rare malware was a significant factor. They argued that avoiding false positives was an important goal and that real-world experiences were more important than arbitrary test results. Geeks like us here at HTG believed them, taking them at their word. We certainly had used Microsoft Security Essentials on our personal computers for years. We hadn’t encountered any malware, even after performing scans with other antivirus programs to get a second opinion. We liked Microsoft Security Essentials for being so lightweight, unintrusive, and not trying to upsell us to paid security suites full of system utilities we don’t need. We liked the idea that Windows 8 users wouldn’t need any additional antivirus protection, eliminating another complicated system tool from Windows users’ lives. The Microsoft Security Essentials website promises “comprehensive malware protection” and “award-winning protection,” so users would be forgiven for believing that Microsoft was committed to making MSE a capable antivirus solution. But Microsoft is now saying that MSE is only basic protection that users shouldn’t rely on. Holly Stewart, the senior program manager of the Microsoft Malware Protection Center, said that Microsoft Security Essentials was just a “baseline” that’s designed to “always be on the bottom” of antivirus tests. She said Microsoft sees MSE as a first layer of protection and advises Windows users to use a third-party antivirus instead. According to Holly Stewart, Microsoft “had an epiphany a few years ago, back in 2011, where we realised we had a greater calling and that was to protect all Microsoft customers.” She says that Microsoft passes its information on to other antivirus makers and helps them make their products better. “We used to have part of our time directed towards predicting test results,” but these people have now been directed to focus on emerging threats and share that information with other antivirus companies. Nevertheless, she argues that “baseline does not equal bad” and says they provide a high-quality antivirus. But Microsoft themselves are recommending users not use MSE, so it’s hard to take that seriously. This isn’t a product average people should use — it’s better than no antivirus, but not something we should recommend. Microsoft is doing a disservice to its users by telling antivirus testing companies that they don’t recommend MSE for average users and telling average users that MSE provides them with “comprehensive malware protection” on their website. Microsoft needs to pick one message and stick to it. Now, if you’re a geek like we are, MSE and Windows Defender are very usable. If you have good security practices and know what you’re doing, you can manage just fine with this lightweight option. But average Windows users don’t always follow proper security practices and should use a strong antivirus that does well in tests — as Microsoft themselves now recommend. If you’re a geek, you probably shouldn’t recommend MSE to your friends or install it on your parents’ computer. Yes, it’s a shame — MSE’s lightweight and hassle-free nature make for a great interface and a faster computer. But the core of an antivirus is the detection engine, and Microsoft appears to be throwing in the towel here. To find an antivirus product that actually offers good protection, consult an antivirus test website and see how your antivirus of choice stacks up. Luckily, one thing hasn’t changed in the latest test results: We still don’t recommend purchasing a paid antivirus because there are solid free options. avast! 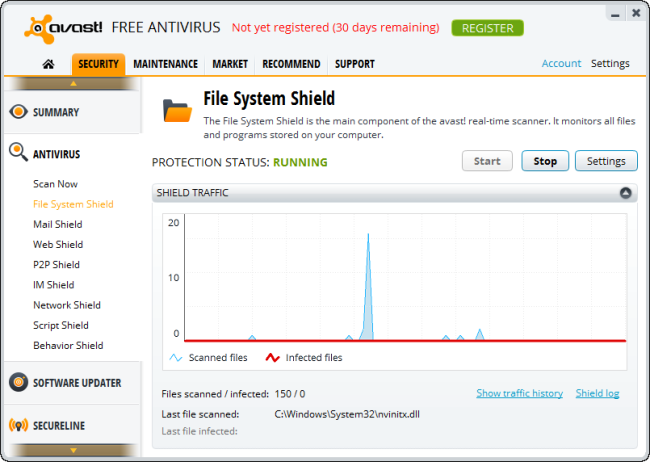 Free Antivirus has done well in tests, offering comprehensive and free antivirus protection. Unfortunately, it’s heavier than MSE, its interface is more overbearing, and it tries to upsell you to a paid product you don’t really need. But that’s the price we pay for solid antivirus protection. For average users — not geeks who can get by with the minimum protection — we’d recommend avast! Free Antivirus. We at HTG would like to apologize for continuing to recommend Microsoft Security Essentials for so long, in spite of test results. We found it worked for us and we didn’t like how heavy and obnoxious other antivirus solutions can be. We believed Microsoft when they argued that MSE provided “comprehensive malware protection” for real-world threats and that antivirus tests weren’t representative of real-world results, as MSE performed well for us. We feel betrayed by Microsoft — they made an internal decision to let MSE decline without telling us. They’re still communicating two different messages — one to antivirus testing companies in interviews and one to average users on their website.